Pink Floyd news :: Brain Damage - Another Brick In The Wall - The Opera: special Brain Damage ticket discount! 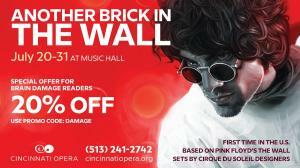 Another Brick In The Wall - The Opera: special Brain Damage ticket discount! 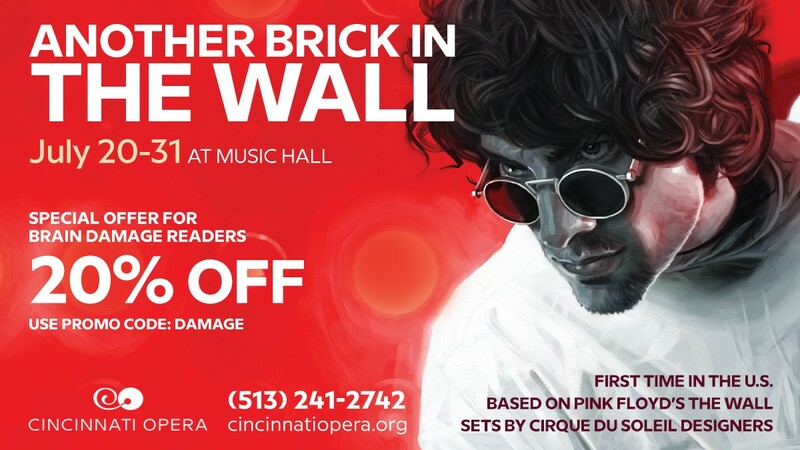 On Thursday, we told you about the new staging of Another Brick In The Wall - The Opera, which opens in Cincinnati, Ohio, on July 20th. The show runs until the end of the month. Created with Roger Waters's full endorsement, it depicts Pink's journey from madness to redemption as never seen before, with sets created by designers from Cirque du Soleil, colossal video projections, a cast of 80, and a 70-piece orchestra in the pit. The production sold out its entire 10-performance run at the world premiere in Montreal last year. Read our fully illustrated review of the Montreal staging here. The organisers have been in touch to offer Brain Damage visitors a very special, 20% discount on tickets! To get the reduction on your ticket price, you need to use the promo code DAMAGE when you place your purchase either over the phone, or online. For more information, and to buy tickets for any of the performances, visit www.cincinnatiopera.org/the-wall.